Childhood extracranial germ cell tumors form from germ cells in parts of the body other than the brain. A germ cell is a type of cell that forms as a fetus (unborn baby) develops. These cells later become sperm in the testicles or eggs in the ovaries. Retroperitoneum (area in the back of the abdomen behind the tissue that lines the abdominal wall and covers most of the organs in the abdomen). Mediastinum (area between the lungs). Extracranial germ cell tumors are most common in adolescents. See the PDQ summary on Childhood Central Nervous System Germ Cell Tumors Treatment for information on intracranial (inside the brain) germ cell tumors. Childhood extracranial germ cell tumors may be benign or malignant. Extracranial germ cell tumors may be benign (noncancer) or malignant (cancer). Childhood extracranial germ cell tumors are grouped as gonadal or extragonadal extracranial tumors. Malignant extracranial germ cell tumors are tumors that form outside the brain. They are gonadal or extragonadal. Gonadal germ cell tumors form in the gonads (testicles and ovaries). Testicular germ cell tumors. Testicular germ cell tumors are divided into two main types, seminoma and nonseminoma. Nonseminomas are usually large and cause signs or symptoms of disease. They tend to grow and spread more quickly than seminomas. Testicular germ cell tumors usually occur before the age of 4 years or in adolescents and young adults. Testicular germ cell tumors in adolescents (11 years and older) and young adults are different from those that form in early childhood. Ovarian germ cell tumors. Ovarian germ cell tumors are more common in adolescent girls and young women. Most ovarian germ cell tumors are benign mature teratomas (dermoid cysts). Some ovarian germ cell tumors, such as immature teratomas, dysgerminomas, yolk sac tumors, or mixed germ cell tumors, are malignant. Extragonadal extracranial germ cell tumors form in areas of the body other than the brain or gonads (testicles and ovaries). Sacrum (the large, triangle-shaped bone in the lower spine that forms part of the pelvis). Mediastinum (the area between the lungs). In children younger than 11 years, extragonadal extracranial germ cell tumors usually occur at birth or in early childhood. Most of these tumors are benign teratomas in the sacrum or coccyx. In older children, adolescents, and young adults (11 years and older), extragonadal extracranial germ cell tumors are often in the mediastinum. There are three types of extracranial germ cell tumors. Mature teratomas. These tumors are the most common type of extracranial germ cell tumor. Mature teratomas are benign tumors and not likely to become cancer. They usually occur in the sacrum or coccyx in newborns or in the testicles or ovaries at the start of puberty. The cells of mature teratomas look almost like normal cells under a microscope. Some mature teratomas release enzymes or hormones that cause signs and symptoms of disease. Immature teratomas. These tumors usually occur in areas other than the gonads in young children or in the ovaries at the start of puberty. They have cells that look very different from normal cells under a microscope. Immature teratomas may be cancer and spread to other parts of the body. They often have several different types of tissue in them, such as hair, muscle, and bone. Some immature teratomas release enzymes or hormones that cause signs and symptoms of disease. Seminomas form in the testicle. Dysgerminomas form in the ovary. Germinomas form in areas of the body that are not the ovary or testicle, such as the mediastinum. Yolk sac tumors make a hormone called alpha-fetoprotein (AFP). They can form in the ovary, testicle, or other areas of the body. Choriocarcinomas make a hormone called beta-human chorionic gonadotropin (β-hCG). They can form in the ovary, testicle, or other areas of the body. Embryonal carcinomas may make a hormone called β-hCG. They can form in the testicle or other areas of the body, but not in the ovary. Teratoma and yolk sac tumors. Mixed germ cell tumors are made up of at least two types of malignant germ cell tumor. They can form in the ovary, testicle, or other areas of the body. The cause of most childhood extracranial germ cell tumors is unknown. Having certain inherited disorders can increase the risk of extracranial germ cell tumors. Klinefelter syndrome may increase the risk of germ cell tumors in the mediastinum. Swyer syndrome may increase the risk of gonadoblastoma and seminoma. Turner syndrome may increase the risk of gonadoblastoma and dysgerminoma. Having an undescended testicle may increase the risk of testicular cancer. Having gonadal dysgenesis (the gonad—ovary or testicle—has not formed normally) may increase the risk of gonadoblastoma. 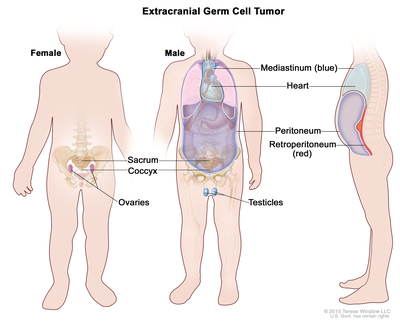 Signs of childhood extracranial germ cell tumors depend on where the tumor formed in the body. A lump in the neck, abdomen, or lower back. A painless lump in the testicle. In females, no menstrual periods or unusual vaginal bleeding. Imaging studies and blood tests are used to detect (find) and diagnose childhood extracranial germ cell tumors. Physical exam and history: An exam of the body to check general signs of health, including checking for signs of disease, such as lumps or anything else that seems unusual. The testicles may be checked for lumps, swelling, or pain. A history of the patient's health habits and past illnesses and treatments will also be taken. Serum tumor marker test: A procedure in which a sample of blood is checked to measure the amounts of certain substances released into the blood by organs, tissues, or tumor cells in the body. Certain substances are linked to specific types of cancer when found in increased levels in the blood. These are called tumor markers. For testicular germ cell tumors, blood levels of the tumor markers help show if the tumor is a seminoma or nonseminoma. Biopsy: The removal of cells or tissues so they can be viewed under a microscope by a pathologist to check for signs of cancer. Sometimes an incisional biopsy or needle biopsy is done before surgery to remove a sample of tissue. Sometimes the tumor is removed during surgery and then a sample of tissue is removed from the tumor. The stage of the cancer (whether it has spread to nearby areas, lymph nodes, or to other places in the body). Where the tumor first began to grow. The type of germ cell tumor. Whether the patient has gonadal dysgenesis. The prognosis for childhood extracranial germ cell tumors, especially ovarian germ cell tumors, is good.